Klara is nearly 5 years old when she arrives at the Eating School with her parents. She is a smart girl and knows exactly what she doesn’t like. She doesn’t like to get messy or to spoon things on her own. She barely wants to even touch solid foods, much less chew or swallow them. In fact, she dislikes these so much that she downright shudders from disgust. Even the idea of having to bite down on a roll, a croissant, or any other similar food strikes fear into her heart. If Klara has too much food in her mouth, she gags. And, she even vomits sometimes. Klara occasionally asks her parents and other people she is close to if everybody has the ability to swallow and whether or not it hurts when they do. Klara’s entire family knows that eating and drinking have never been easy for her. Klara has always had difficulty with her weight. She was born very prematurely and had a birth weight of under 500g. The early days after her birth were not easy; she had difficulty adjusting and could not breath on her own, which meant that she required oxygen. As a result, Klara had to spend her first months of life in a hospital. Despite all of this, she still managed the transition to oral foods. At six months, Klara was discharged from the hospital without oxygen and without a feeding tube. Once home, she initially accepted bottles with breast milk. Her transition to baby foods also succeeded with no problems. At one and a half years old, Klara only liked specific baby foods, and these had to have a very specific texture, with no pieces or chunks. Anything else, she would refuse. And, so, she was fed from that point on only with “her purees.” Klara also only accepted fluids in small amounts. As a result, Klara’s weight stagnated. The doctors began to discuss laying a PEG-tube, but her parents tried to improve the situation with enriched, high calorie purees. The change was not easy, but Klara did accept the new food little by little. At three years old, Klara entered preschool. The process of acclimating to this new environment was stressful on all sides, and Klara didn’t feel comfortable at the start. The preschool teachers were sensitive to her struggle and succeeded in feeding Klara at preschool. About a year ago, the situation changed again and Klara began to refuse to be fed at preschool at all. Feeding could only happen at home; in any other place, it was met with refusal. At home, Klara was fed in a very specific manner: during feeding, she had to be distracted (e.g. being read to, watching a video, etc.). Her parents and other family members consistently offered her finger foods. At first, Klara made some progress in eating independently – with the help of distraction and rewards during feedings, and her family’s patience, she managed to eat a few spoonfuls on her own. At this point, several family problems occurred. Klara’s grandmother, to whom Klara had a very close connection, became very ill and passed away. Klara developed a series of serious infections, resulting in the loss of her newly acquired skills of self-feeding. The infections themselves had a further negative effect on her weight development. She lost weight, which could only be recovered with great difficulty. Since then, the entire eating situation has become more and more strained. The entire family has become concerned and begun seeking help from a variety of local experts. Over the past couple of years, Klara has participated in several eating therapy programs. However, the much hoped for improvements in the eating situation have failed to materialize, and the breakthrough has not occurred. Klara continues to be fed almost solely with high calorie purees, and the possible solution of laying a PEG-tube is back on the table again. This is when Klara’s parents hear about NoTube from a good friend and decide to travel to Graz and take part in eating therapy based on the Graz Model. They want to avoid the PEG-tube if at all possible, as they worry that the synthetic materials and movement restrictions would be hard for the active Klara to tolerate. Instead, they want Klara to improve her self-feeding skills, increase her ability to swallow pieces, and reduce gagging. They also want to decrease the attention given to, and the significance placed on Klara’s eating behaviors by that the whole family. Although, it is hard for them to imagine what it would be like to eat such a small selection of foods, Klara’s parents believe in her. None of Klara’s other family members have eating behavior issues. In Graz, Klara works on her independence and self feeding skills in groups and individual sessions. She learns to tolerate touching foods – she participates more and more in the sensory groups, interacting with various textures and smells. Klara is really motivated to change even when it isn’t easy. The Eating School is therapy for the entire family. 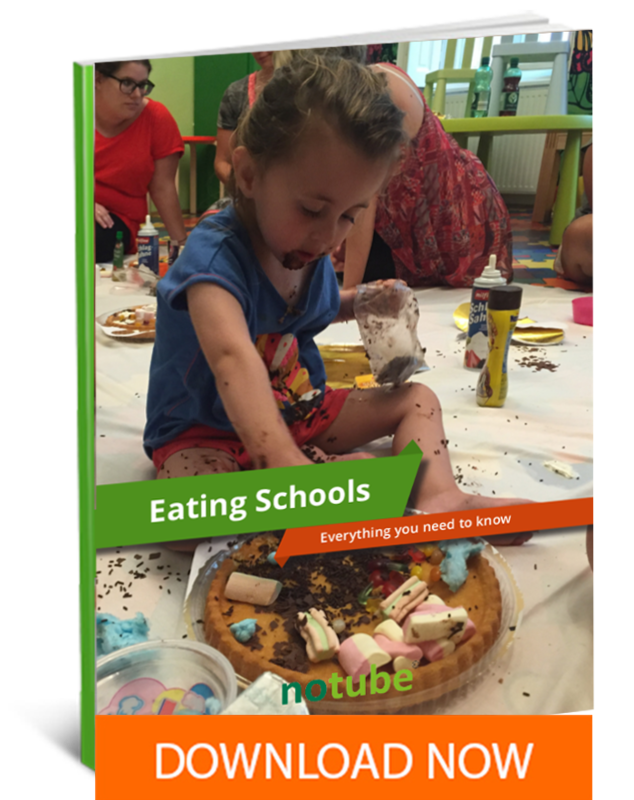 Fears and concerns that arise in eating and feeding situations are discussed, and strategies and solutions are established that will help foster the children’s self-feeding skills. Klara learns to calm her fears. She develops small sayings like, “One, two, three, eating can be trouble free,” and manages to independently drink high caloric liquid nutrition in addition to water and tea. Klara makes progress with solid foods as well – she might need a bit longer to eat her chips, but she learns to swallow them. She begins to trust these newly acquired skills and is brave enough to swallow more and more solid food. The first steps toward independent eating are taken in the Eating School, and Klara’s courage is awakened. She is excited to return to preschool – she knows that soon she can eat with her friends at the table. Klara is one of many children who have difficulty tolerating foods with particular consistencies. Fear of novelty plays a significant roll in this type of issue. Klara’s story demonstrates that eating therapy involves the entire family. Eating does not affect only the person eating, but takes place in a social context and is occurring on many sensory levels simultaneously. We not only see and smell a food or drink, we feel it as well – in the truest sense of the word. At NoTube, we build the ideal environment to foster progress for the families that come to us for treatment. Our child-centered approach helps us to meet children where they are on developmental, sensory, and oral motor skill levels. More information on our programs is available here.